Lots of diet-conscious coffee and tea drinkers automatically reach for a packet of artificial sweetener over good ol' sugar to avoid consuming a whole bunch of empty calories. However it turns out that Splenda -- one of leading so-called "zero calorie" sweeteners -- isn't truly free of calories, according to this revelatory food chemistry video. In the video, YouTuber Alex Nickel walks through a series of fairly basic experiments to figure out whether Splenda has any "usable calories." To do this he compares the levels of glucose in both sugar and Splenda, since that's the chemical our bodies turn into energy when we digest sugar. The results showed that Splenda actually has more glucose in it than sugar (which Alex points out isn't all that surprising considering Splenda's main ingredient is dextrose, which is a form a glucose). 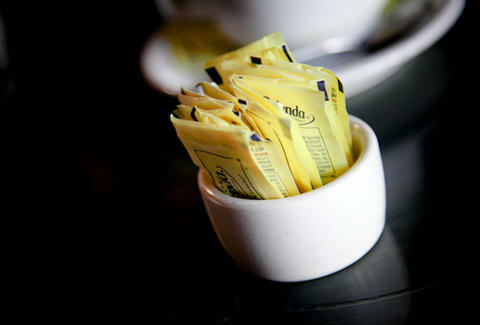 After Alex reached out to Splenda to explain how a packet could contain so much glucose and still claim it's free of calories, a representative got back to him to say that each packet -- roughly a gram's worth of Splenda -- actually contains four calories. Interestingly, that's as many calories that a gram of sugar contains. Amazingly, Splenda isn't violating any laws by claiming it has zero calories because according to FDA nutrition label guidelines, it's totally fine to market your product as calorie-free as long as each serving has fewer than five calories. And since a single-serving packet of Splenda packs the sweetness equivalent to two teaspoons of real sugar (or roughly 16 calories of sugar), it does allow you to enjoy the same sweet flavor without consuming nearly as many empty or nutrition-free calories as you would otherwise. Joe McGauley is a senior writer for Thrillist. Splenda gives him a headache.